A banquet hall is a space offered mainly for weddings, birthdays, bridal showers and other personal events. They could be separate or part of a hotel or restaurant. Most banquet hall providers offer food and catering along with the hall. Most times, the provider will charge you for the number of guests as he will offer specified tables and chairs. Capacity: How many guests will the hall accommodate easily? Refer to your guest list for that and ask your provider for the right size. A smaller hall will be uncomfortable for your guests, while a larger size might affect people’s perception of its success. Interiors: Most providers offer banquet halls in Dubai with certain themes. You might want to see the props and the furniture before booking the hall. If the banquet hall isn’t maintained properly, the furniture might be run down, or worse, broken. That won’t reflect well on your event. Location: Find a hall that’s near your guests. You don’t want to invite them to a banquet hall in Bur Dubai if most of your guests are in Jumeriah. Other Amenities: Many banquet hall providers offer extra amenities to sweeten the deal. Depending on the cost, this might include AV equipment, parking space, on-site catering, and even a Wi-Fi connection nowadays. Soundproof or a quiet space: You don’t want distractions during your meeting. Your team should be able to listen to each other properly without having to shout. Plus, you also don’t want the minutes of your meeting to leave the room. Other Amenities: Meeting rooms should ideally come equipped with AV equipment, blank wall space to hang paper, fast and reliable internet connection. Limited Visual Distraction: Most meeting rooms have the same blank wood paneled walls and swivel chairs. That’s because the designers don’t want you distracted during a meeting. Location: Look for a central space. A place where people can easily attend and enjoy the event. It should be accessible to your target attendees through mass transportation or preferably walkable. Capacity: Find out the capacity of the space. Venue providers have an accurate estimate of the number of people their space can comfortably fit. A bigger capacity won’t hurt your event space as much as a smaller space would. You want people to move easily within the space. 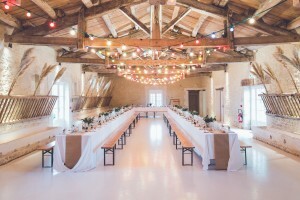 Layout: Most event spaces don’t have fixed layouts. Venue providers offer different layout depending on your event type and size. Choose a layout that works best for your kind of event. Banquet hall, meeting room and event space all serve a different audience and a purpose. Banquet halls are meant for big, personal events. Meeting rooms are corporate spaces, with less room for any creative outlet. A banquet hall is the least formal of these three venues. A meeting room should be the most formal since it is meant for conferences and serious discussion. An event space can be either formal or casual, depending on the event. Usually, event spaces cover a larger square foot as compared to a banquet hall or meeting room. Now that you know the difference between a banquet hall, meeting room and event space, you have better chances of finding the perfect venue. Browse through the best event and party venues in Dubai with fluidmeet. Next PostHow big should the banquet hall be? Is there a golden rule?